From the moment that Luke and I moved into our home I have wanted a grill for our backyard. I find it t hard to come up with meals in the summer. It's too hot to do a big casserole from the oven, and usually a cool salad doesn't feel us up (we are big eaters unfortunately). So when we moved into the house I instantly wanted a grill. However there were wood floors to buy, a new guest bed, bookshelves, various decorations, etc etc. And the grill got put on the back burner. Until the beautiful month of July when we decided it would be the perfect month to get a beautiful grill. Well first Luke decided that we would get a grill, then he started crazy talk about needing microphones, and microphone stands, and all sorts of musical equipment that would not cook wonderful steaks and hamburgers. After a bit of convincing Luke agreed it was time for the Tree's to purchase a grill. 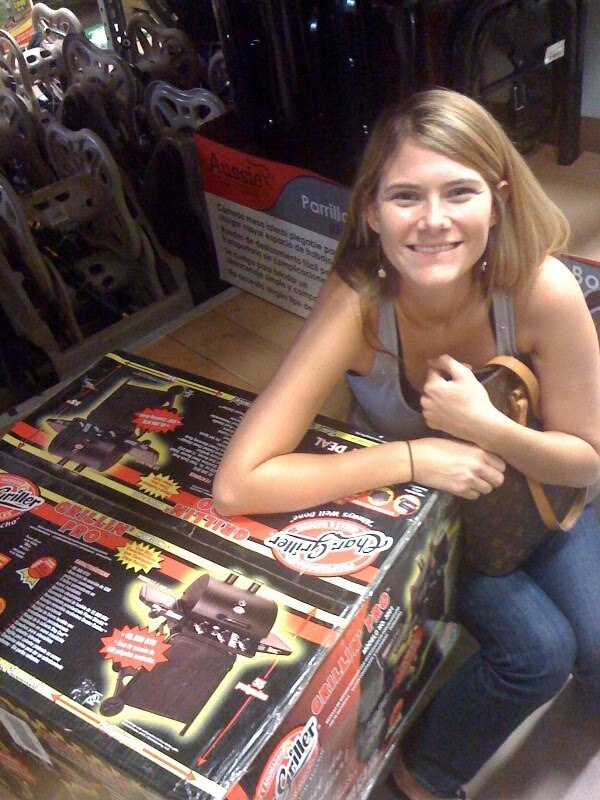 Here I am with the grill trying not to gloat. This is where I sat, next to the girll convincing Luke that it belonged in our home. We brought it home and put it together (we being a relative term, Luke might have been the only person who put it together) and then we (again, relative) grilled some yummy burgers! I have a feeling this is the beginning of a long and beautiful relationship. In other news I saw this T-shirt today and it took everything within me not to purchase it. I mean what child of the late 80's early 90's doesn't need this t-shirt??!?! Are there any fellow grillers out there? What is your favorite thing to grill? Any secrets we (Luke) should know about?!?! Get a veggie basket! Mmmmmmmmm grilled squash and zucchini and onion and cherry tomatoes and red potatoes!!! Haha!!! Sooooo love that shirt, LOL!!!!! I honestly don't know anything about grilling all we have is a little weber charcoal grill so I am super jealous of your new grill! That's exciting! Anywhoo I just wanted to say that that shirt is all kinds of awesome! I have never seen anything like it. Anyways have fun with your new grill! 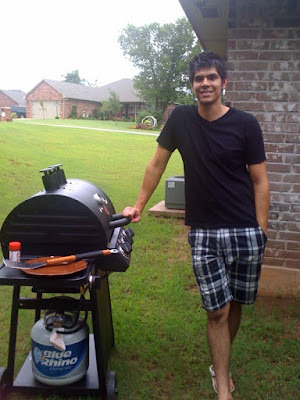 We are HUGE grillers, once a week rain or shine my husbands is grilling something. He is among the "charcoal" camp at home with our Weber but we have a little portable gas grill for tailgating. Grilling makes the meal like an event, so that's out favorite part! 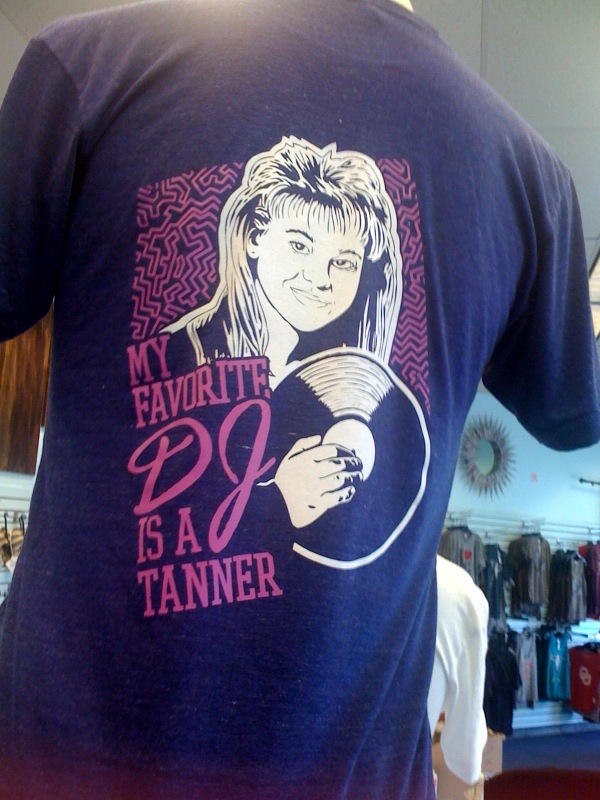 Um, that DJ Tanner t-shirt is awesome. I'm so glad you were able to convince Luke that the grill was needed!! And LOVE that DJ shirt!!! Ha! We (or actually my husband) grills at least 3 times a week and has two grills! Grilled veggies are really yummy! And of course steak, burgers, hot dogs, and chicken, fish....anything is good grilled :) have fun! We have the same grill and love it! Along with whatever meat we are doing, I always slice up squash and zuchinni and fold it in tin foil with a few pieces of butter. Throw that on the grill and it makes the most divine veggies! The foil will blow up to a big pillow looking thing too and looks cool! ha! I love the idea of a grill! It's so nice to be able to cook outside and not heat up the house. And that t-shirt?! Why didn't you buy it?! :) Classic. Love using the grill. Unfortunately we left ours with our house :-) but I'm excited to get a new one when we move downtown! Oh, we love grilled broccoli! Toss it in lemon juice, parmesan cheese, salt and pepper. Then grill on indirect heat for about 10 minutes...just until the ends start to char. It's delicious! I love my BBQ, it's been months since I purchased mine, and we have an amazing relationship. It provides me with delicious and healthy meals without heating my apartment up hotter than the crazy heat we already have. I think I have used my oven 3 times since I bought it. Best BBQ advice I have to give you: potatoes. I love to buy the baby potatoes (both red and white) and cut them up into quarters and make a aluminum foil bag for them (make it extra thick), add garlic, butter or oil, and some seasoning. Throw the BBQ bag on the grill for about 20 minutes per side, it's truly amazing. Usually I heat one side on high, and then on the other side that is lower I put the bag on. Enjoy!! Yay for your new grill! We get so much use out of ours in the summertime! I love that t-shirt, too funny!!! Seriously I LOVE LOVE LOVE that t-shirt! Where in the heck did y'all find it?? The hubs grills out all the time during the summer. We love it! I have 2 fave grill recipes for you. Pork kabobs: Cut up tenderloin into medallions, season as you like (sometimes I marinate in teriyaki sauce), and string onto soaked wooden skewers along with slices of sweet onion, pepper, and nectarine! OMG so yummy when all those flavors mingle. My other favorite is salmon. Can you get decent salmon fillets where you are? If so season with garlic, salt, pepper, thyme, and lay onion rings and lemon slices across the top. Wrap in a foil packet and grill away. that shirt is just plain awesome! we grill all the time! and we have done the potatoe deal above many times. so good! That shirt is awesome! I like anything on the grill, especially steak, hamburgers, and corn. Oh, and grilled homemade pizza! When I first got my grill, I forgot to scrape it and it got icky, oops! Now I use a wire brush afterward and it works great. Congrats on the new grill.... and I LOVE that shirt? where did you see it at? That is a must have! That shirt is all sorts of rad! We have grilled out a ton this summer! You will love having it! The t-shirt is so funny! I think that Candace Cameron twittered/tweeted(?) a picture one day of her husband wearing a similar shirt! We have our grill out all the time! My husband has a delicious marinade for chicken and I could seriously eat it every day! We like to throw corn on the grill with it (just leave the husks on) zucchini and potatoes. Grilled pizzas are also divine and for dessert you must try grilled peaches! Cut the peaches in half, sprinkle them with cinnamon and the second you take them off the grill drizzle them with honey, it's our favorite summer dessert of all time! LOVE the grill!!! Chicken, pork chops and tenderloin, steaks, even veggies...although my husband doesn't love veggies! You look so cute posing with the grill! I second the Canvendar's suggestion. We use it to season EVERYTHING we grill. mmmmm..
grilling in the summer time is the only way to go. and for real, i still can't get over that shirt. how much is it because i might be giving you cash money to get me one. I love when my husband grills. Everything tastes better grilled during the summer. And that shirt! I must find one! I love grilled food! It tastes so much better to me. Here is the best marinade ever...promise! Sound weird but delish and works on anything...steak, pork, chicken, turkey, etc. Let me know if you try it! :) Everyone we make it for becomes a believer. Also, corn on the cob is delish. Grilled pizza are super easy, low fat, and delicious. And grilled peaches are always a big request at this house in the summer! I cut chicken breasts into chunks and marinade them in a teriyake or sesame ginger sauce(Lawrys is my fave). I let it marinade while I cut up red onion, red/yellow peppers and clean mushrooms. I also let wooden skewers soak in water in the meantime. Build your skewers then bbq them on low basting them with extra sauce... they're SO good! Def soak the corn husks before grilling them. Another yummy trick for corn is peeling the husks back & removing the silky things first then put a tad of EVOO & Mrs. Dash seasoning then put the husks back in place & grill! Healthier than gobs of butter & salt!